The rate at which consumer prices rise following a depreciation of the currency, known as the exchange rate pass-through, has been declining. The column uses a decomposition of exchange rate pass-through into the component that can be attributed to pricing of imported goods at the dock, and the second-round effects on domestically produced goods and services, to show that reductions in second-round effects are largely responsible for the decline in pass-through. Enhanced monetary policy credibility is strongly associated with this reduction. 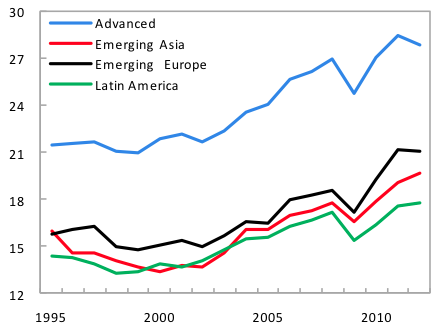 Exchange rate pass-through – the rate at which consumer prices rise following a depreciation of the currency – is an important statistic in international macroeconomics. It has been on the minds of emerging market policymakers recently, as their currencies fall. Previous research has reported wide variation in exchange rate pass-through across countries and over time, though most observers agree that, during the past few decades, exchange rate pass-through has declined. What are the factors that determine exchange rate pass-through? Taylor (2000) argued that improvements in monetary policy performance – reflected in stronger nominal anchors and low, stable inflation – create an endogenous reduction in the pass-through to consumer prices. In his argument, the extent to which a firm decides to pass along an increase in its costs depends on how people expect the general price level to behave in the future, and the degree of pass-through following a depreciation will vary according to whether inflation expectations are well anchored. In a recent paper, we test Taylor’s hypothesis (Carrière-Swallow et al. 2016). We find evidence that price stability and greater monetary policy credibility are important determinants of exchange rate pass-through, and that improvements in both can largely account for the reductions in exchange rate pass-through in the past few decades. To understand how credibility affects pass-through dynamics, we distinguish between the adjustment of two broad groups of prices: those that are set at the border; and those that are set within the border, for which we assume that domestic monetary policy would play a larger role. We use global input-output tables to construct benchmarks for the amount of pass-through that can be attributed to the first group – that is, for the price response of foreign goods and services at the border. Previous work has found that monetary policy credibility plays only a small role in determining pass-through to prices at the border. We complement that result by showing that it plays an important role in reducing the exchange rate pass-through to prices of domestically produced goods and services. A change in the exchange rate is expected to trigger an adjustment in relative prices between tradable and non-tradable goods and services, and a transitory change in consumer price inflation.1 The size of this first-round effect will depend on how much the local-currency price of imported goods adjusts at the border, and on the share of these goods in domestic consumption, including their role as inputs in the local production of consumer goods. When other prices in the economy – including retail markups, distribution costs, wages, and the price of non-tradable goods – also react to the exchange rate movement, these are second-round effects on consumer prices. Aggregate price indices are not constructed using these concepts, which makes empirical work harder to do. While many countries produce an index of retail tradable goods prices, approximately half the retail price of the average tradable good is made up of local distribution costs and markups (Burstein et al. 2005). Additionally, imported inputs are factors of production for domestically produced consumer goods and services that may or may not be tradable. Following Burstein et al. (2005) and Gopinath (2015), we use input-output tables to compute the share of imports in domestic consumption (Figure 1). This includes imported consumer goods, as well as the imported inputs used in domestically-produced goods. 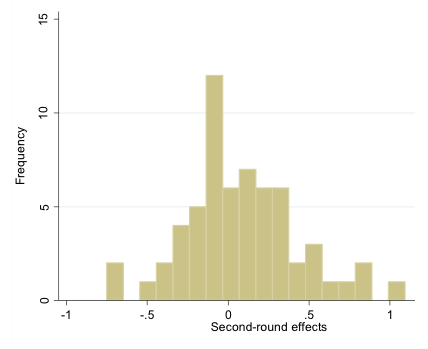 We construct two benchmarks for first-round effects. The first is the import content of domestic consumption, and so imposes the assumption that exchange rate pass-through to import prices is complete. Since previous research has documented evidence of incomplete pass-through to import prices in some countries, the first benchmark is likely to be an upper bound for the role of imported goods in exchange rate pass-through to consumer prices. The second benchmark relaxes the complete pass-through assumption, and is the product of the import content and an estimated pass-through coefficient to import prices. 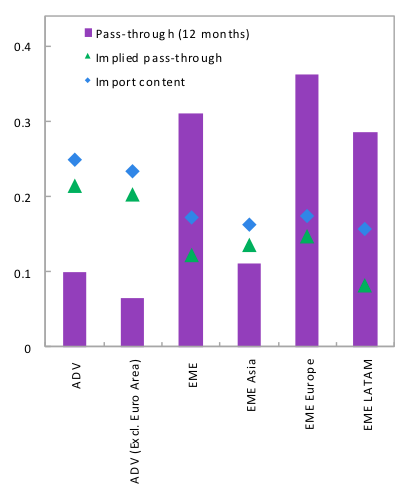 While pass-through to imported goods prices may have fallen, the importance of imported goods and inputs in overall consumption has increaser at the same time (Figure 1a). Sources: Eora MRIO and authors’ calculations. Note: Direct imports correspond to the share of imports of final consumption goods in total private consumption. Indirect imports are computed by multiplying the value of output of each domestic sector absorbed by resident households by the share of imported inputs in that sector’s output value, and then summing across sectors. Total import content is the sum of both components. Next, we use a standard local-projections approach to estimate exchange rate pass-through to consumer prices in a sample of 62 emerging and advanced economies. We compare these estimates with the first-round effects benchmarks and use them to construct a measure of second-round effects, defined as the difference between the estimated exchange rate pass-through and the benchmarks. 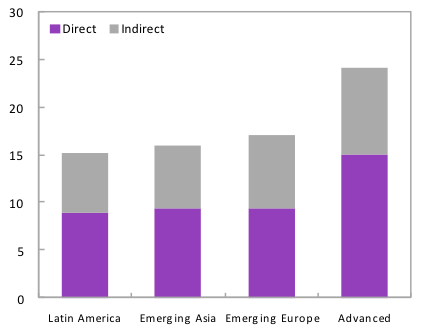 As in previous research, we find large differences in pass-through across countries, including across income levels and regions (Figure 2a). Rolling window estimates suggest that exchange rate pass-through has fallen everywhere during the past few decades in all country groups, with the largest falls recorded in emerging economies (Figure 2b). Note: Cumulative response of headline consumer prices (in percentage points) to a 1% innovation in the nominal effective exchange rate after one year. Import content corresponds to the ratio of imported private consumption (including direct imports and the import content of domestically produced goods consumed locally) to total private consumption. Implied pass-through refers to the product of the import content of consumption and the estimated exchange rate pass-through to import prices after one year. The large reductions in exchange rate pass-through (the bars in Figure 2b) cannot be accounted for by the combined changes in the sensitivity of prices at the dock, and the import content of consumption (triangles in Figure 2b). 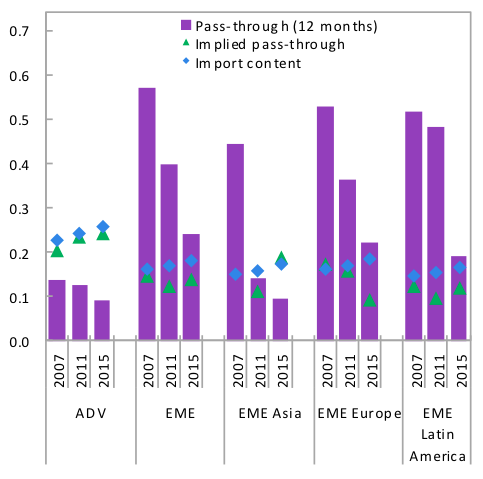 The largest part of the fall in pass-through during the past few decades is due to smaller second-round effects, especially in emerging economies. 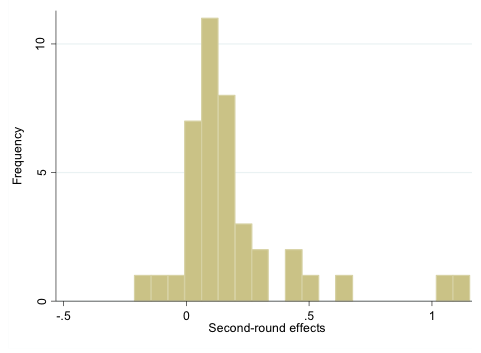 Nevertheless, we find a lot of cross-country and time variation in our measure of second-round effects, and that they are still substantial in many economies (Figure 3). Note: Distribution of second-round effects for the 62 economies (Figure 3a) and 40 economies (Figure 3b). We then explore how our estimates of exchange rate pass-through are related to measures of monetary policy performance, including credibility. Previous research on the determinants of exchange rate pass-through has found evidence that pass-through to overall consumer prices is associated with the level and volatility of inflation (e.g. Gagnon and Ihrig 2001, Choudhri and Hakura 2006). We confirm this result, and complement it with evidence based on inflation expectations. Following Dovern et al. (2012) and Capistrán and Ramos-Francia (2010), we proxy for monetary policy credibility using the degree of disagreement among professional forecasters of inflation. We found that, for a given level and volatility of inflation, greater credibility of monetary policy reduces exchange rate pass-through. Other research has studied exchange rate pass-through to import prices, finding that macroeconomic factors – including variables associated with monetary policy performance – have played only a minor role in explaining the wide variation across countries and over time (Campa and Goldberg 2005, Frankel et al. 2012).2 Our work complements both strands of research by focusing on the role of monetary policy credibility in determining the price response of domestically-produced goods and services (including distribution costs and markups), which are more likely to be influenced by the domestic inflationary environment than prices at the border. We find that greater monetary policy credibility affects overall exchange rate pass-through to consumer prices primarily through reductions in second-round effects.3 These results are robust to the use of our alternative benchmark for second-round effects, which relaxes the assumption of complete pass-through to import prices. What determines the response of consumer prices to currency depreciations is a longstanding question in macroeconomics. We have proposed an empirical decomposition of pass-through to CPI based on the component that can be attributed to pricing of imported goods at the dock. This has allowed us to infer the response of the remaining, domestically produced goods and services, which we have labelled as second-round effects. We find that a generalised fall in exchange rate pass-through has taken place, despite an increase in the import content of domestic consumption. Given only modest declines in pass-through to import prices, we can conclude that reductions in second-round effects are largely responsible for the decline in overall pass-through to consumer exchange rate pass-through, that enhanced monetary policy credibility is strongly associated with reductions in exchange rate pass-through, and that this largely works through lower second-round effects. Burstein, A, M Eichenbaum, and S Rebelo (2005), “Large Devaluations and the Real Exchange Rate,” Journal of Political Economy 113(4): 742-784. Campa, J M and L S Goldberg (2005), “Exchange Rate Pass-Through into Import Prices,” Review of Economics and Statistics 87(4): 679-690. Capistrán, C and M Ramos-Francia (2010), “Does Inflation Targeting Affect the Dispersion of Inflation Expectations?” Journal of Money, Credit and Banking 42(1): 113-134. Carrière-Swallow, Y, B Gruss, N Magud, and F Valencia (2016) “Monetary Policy Credibility and Exchange Rate Pass-Through”, IMF Working Paper 16/240, Washington, DC. Choudhri, E U and D S Hakura (2006), “Exchange Rate Pass-Through to Domestic Prices: Does the Inflationary Environment Matter?” Journal of International Money and Finance 25(4): 614-639. Dovern, J, U Fritsche, and J Slacalek (2012), “Disagreement Among Forecasters in G7 Countries,” Review of Economics and Statistics 94(4): 1081-1096. Frankel, J, D Parsley, and S J Wei (2012), “Slow Pass-Through Around the World: A New Import for Developing Countries?” Open Economies Review 23: 213-251. Gagnon, J E and J Ihrig (2004), “Monetary Policy and Exchange Rate Pass-Through,” International Journal of Finance & Economics 9(4): 315-338. Gopinath, G (2015), “The International Price System,” Working paper 21646, National Bureau of Economic Research: Cambridge, MA. Taylor, J B (2000), “Low Inflation, Pass-Through, and the Pricing Power of Firms,” European Economic Review 44(7): 1389-1408. Burstein et al. (2005) show that the usual decomposition of consumer prices into tradable and non-tradable components that relies on retail prices can be misleading for pass-through analysis. The reason is that the retail price of tradable goods includes two sizable non-tradable components: distribution costs – including wholesale and retail services, marketing, advertising, and local transportation services – and local goods that are produced only for the local market. These components reflect the pricing of locally-produced goods and services that are unlikely to be arbitraged in international markets, while prices of imported goods at the border better capture the pricing behavior of ‘pure’ traded goods. Campa and Goldberg (2005) and Frankel, Parsley, and Wei (2012) found that while higher inflation and exchange rate volatility are associated with higher pass-through to import prices, they are not of first-order importance in explaining its cross-country and time variation. See Tables 3–5, columns 7 and 8 in the original working paper (Carrière-Swallow et al. 2016) for details.